Over one in five residential properties in Metro Vancouver Subdivision A are subject to non-resident participation, a higher rate than any census subdivision (CSD) with more than 5,000 properties among the three provinces for which data are currently available (Nova Scotia, Ontario and British Columbia). New data also show that residential properties owned solely by non-residents of Canada are more likely to have only one owner on the property title. Detailed analysis using these data is provided in the Canada Mortgage and Housing Corporation article, "Residential property in British Columbia, Ontario, and Nova Scotia: Overview of residency ownership, residency participation, and number of owners," which will be available on March 12, 2019, at 11:30, Eastern Time. Today, Statistics Canada is releasing detailed information on the ownership arrangements of residential properties. New data are being released for the 2018 reference year, including information about the number of owners and the extent of participation by non-resident owners. These data are directly comparable with data released in December 2018 on non-resident ownership. Since 2017, the Canadian Housing Statistics Program has published information on residential property ownership using the residency ownership classification. The residency ownership classification assigns non-resident ownership to a property whenever more than 50% of owners on the title do not reside in Canada. In addition, Statistics Canada is now introducing a residency participation classification. The residency participation classification assigns non-resident participation when at least one non-resident owner is on the property title. The residency participation classification provides an upper bound in measuring the number of residential properties with owners residing outside of Canada. 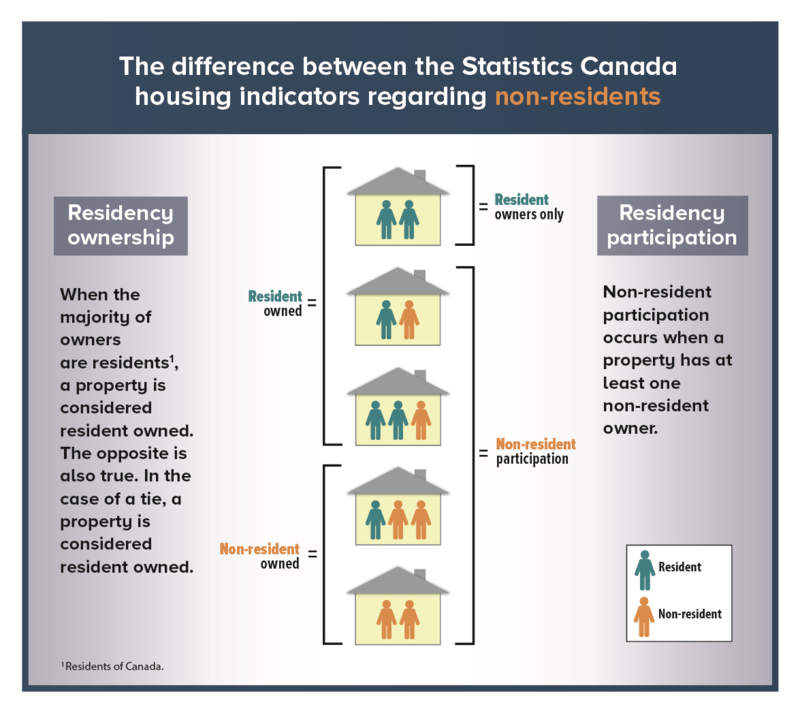 The rate of non-resident participation can be easily compared with the rate of non-resident ownership, providing complementary estimates of non-resident demand for Canadian properties within the same reference period and within the same jurisdiction. This new classification should be interpreted with care (see note to readers). 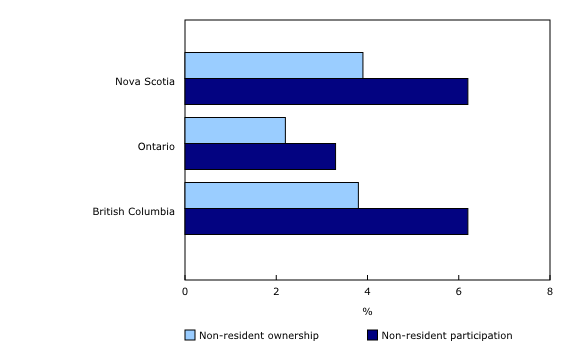 As previously reported, the rate of non-resident ownership is 3.9% in Nova Scotia, 3.8% in British Columbia and 2.2% in Ontario. By comparison, non-resident participation is 6.2% in Nova Scotia and British Columbia, and 3.3% in Ontario. The rate of non-resident participation is always higher than the rate of non-resident ownership. In British Columbia, Nova Scotia and Ontario, the CSDs with the highest rates of non-resident ownership also have the highest rates of non-resident participation. Among CSDs with more than 5,000 properties in Ontario and Nova Scotia, the highest rates for both indicators are in recreational areas near the United States, such as Leeds and the Thousand Islands in Ontario, or Lunenburg in Nova Scotia. In British Columbia, some of the highest rates for both indicators are in the Vancouver census metropolitan area (CMA), particularly for condominium apartments. Recreational areas like Whistler also have high rates of non-resident ownership and participation. The share of the stock of properties and the share of total assessment value of properties held by non-residents varies by province. In Ontario, the share of total assessment value is proportionate to the share of the stock held by non-residents. Meanwhile, in Nova Scotia, non-residents account for a disproportionately small share of total assessment value, in part due to the tendency for non-residents to own vacant land in rural areas. The opposite is true in British Columbia where non-residents account for a disproportionately large share of total assessment value, particularly among condominium apartments in the Vancouver CMA, and in recreational destinations like Whistler. 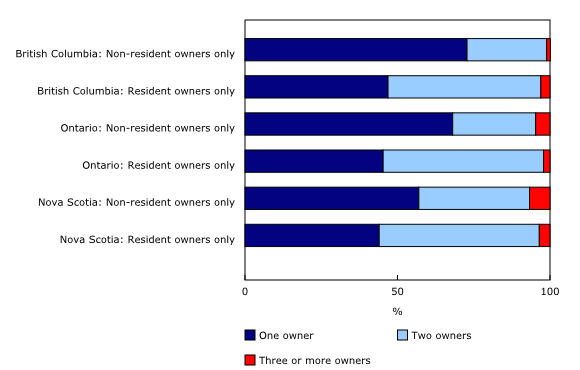 Properties owned by non-residents are more likely to have only one owner on the title. In British Columbia, among properties owned by non-residents only, almost three-quarters (72.8%) have just one owner. In contrast, among properties owned by residents only, less than half (46.9%) have just one owner. The same pattern can also be observed in Nova Scotia and Ontario, although the differences are less pronounced. Regardless of the residency status of the owners, the number of owners on the property title does not vary greatly by jurisdiction. In each of Nova Scotia, Ontario and British Columbia, around 45% of all residential properties have one owner, close to half of properties have two owners, and a small minority have three or more owners. Condominium apartments are more likely to have one owner. As discussed in a previous release, condominium apartments also tend to have lower assessment values than other property types. Properties held by just one owner tend to have lower median assessment values than those held by multiple owners, with two exceptions. First, in British Columbia, properties owned solely by non-residents have higher median assessment values than those owned solely by residents. Second, in Nova Scotia and Ontario, vacant land properties with only one owner have higher median assessment values than those that are co-owned, partly due to the greater presence of non-individual owners (that is, firms and governments) in the market for vacant land. Additional analysis of non-individual ownership in the market for vacant land was made available in a previous release. Metro Vancouver A is a unique part of the Vancouver census metropolitan area that ranges from urban, suburban, seasonal use, to rural and remote areas. The majority of the population is located at the University of British Columbia and the University Endowment Lands. The residency participation classification should be analyzed with care. Please see the variable definition page for more information. Property owner refers to an individual or non-individual (that is, a firm or a government organization) that has property title transferred to, recorded in, registered in or otherwise carried in their name. Residency ownership is defined as follows: a property is classified as resident-owned when the majority of owners are defined as residents. Conversely, a property is classified as non-resident owned when the majority of owners are defined as non-residents. When there is an equal number of resident and non-resident owners for the same property, the property is classified as resident-owned. Residency participation is defined as follows: a property is classified as having non-resident participation when at least one owner is defined as non-resident. Conversely, when there are no non-resident owners, a property is classified as having resident owners only; it is deemed to be exempt from non-resident participation. Residential property refers to all land and structures intended for private occupancy, whether on a permanent or temporary basis. A property may have more than one owner or an owner may have more than one property. Assessment value refers to the assessed value of the property for the purpose of determining property taxes. It is important to note that the assessed value does not necessarily represent the market value. The assessment values in Nova Scotia and British Columbia are in 2017 dollars, while the assessment values in Ontario are in 2016 dollars. Given that different provinces and territories have their own assessment periods and durations of the valuation roll, it is difficult to make accurate comparisons of similar properties from one province or territory to another. For properties that are being utilized for both residential and non-residential purposes, only the residential partitions' value has been taken into account. To enquire about the concepts, methods or data quality of this release, contact Jean-Philippe Deschamps-Laporte (343-998-7200; jean-philippe.deschamps-laporte@canada.ca), Investment, Science and Technology Division.